Local celebrity Lil’ P-nut stars in new Nickelodeon sitcom. Lil’ P-Nut as Louie in The Haunted Hathaways. The days of telling viewers "We don't care about your credit. We care about you" in It's All Good Auto Sales commercials are just a distant memory for pint-sized rapping sensation Benjamin "Lil' P-Nut" Flores. 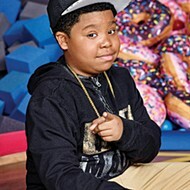 The 11-year-old Memphis-bred actor and musician has moved on to a starring role in Nickelodeon's new television series, The Haunted Hathaways. The show premiered in July, attracting 3.3 million viewers. "So far, the show is amazing," Lil' P-nut said. "[There are] a lot of special effects. I get to play a ghost, and that's pretty cool. That's one of the reasons I wanted to do it." The show centers on a recently divorced mother and her two daughters who relocate to New Orleans into a home occupied by three ghosts. The supernatural trio is composed of a single father, Ray Preston, and his two sons, Miles and Louie, who is played by Lil' P-Nut. The youngest of the Preston family trio, Lil' P-Nut's character is a sarcastic, playful ghost who enjoys scaring the Hathaways with his supernatural powers. He's still in the early stages of displaying his ghastly talents and doesn't tend to be as scary as he would like. Lil' P-Nut not only acts in the episodes but shows off some of his rapping skills as well. "Acting is really fun," Lil' P-Nut said. "When I first started out, I thought, This is cool. I want to do more of it. And rapping, I've been doing it since the age of 4, so it feels good to be rapping in the show, because I can do two of the same things that I love at one time." Lil' P-Nut said he was selected for the show after its producers conducted a talent search. He said his "personality" and "swag" won them over. To date, Lil' P-Nut has reached more than 10 million hits for his viral videos. He got his break as rapping salesman Lil' Goody in the It's All Good Auto Sales commercials alongside business owner Mark Goodfellow. He's had a couple appearances on Ellen DeGeneres' show, played the voice of Atticus (the rapping penguin) in the film Happy Feet Two, and has occasionally pumped up the crowd at Memphis Grizzlies games at FedExForum. "It feels amazing [to be at this point in my career]," Lil' P-Nut said. "I'm starting off as a kid, and I'm doing stuff that grown-ups wish they could do. I think it's just fun. I'm happy. I want to thank God for putting me where I'm at right now." The Haunted Hathaways is filmed at Paramount Studios in Los Angeles, which led to Lil' P-Nut and his family moving to the area. He says the Bluff City stays on his mind. "I'm out here doing the show, so I don't have a lot of time to come back," he said. "The things I miss about Memphis are my friends, my family members, all my fans, [and] the barbecue especially." The Haunted Hathaways airs at 7:30 p.m. every Saturday on Nickelodeon.